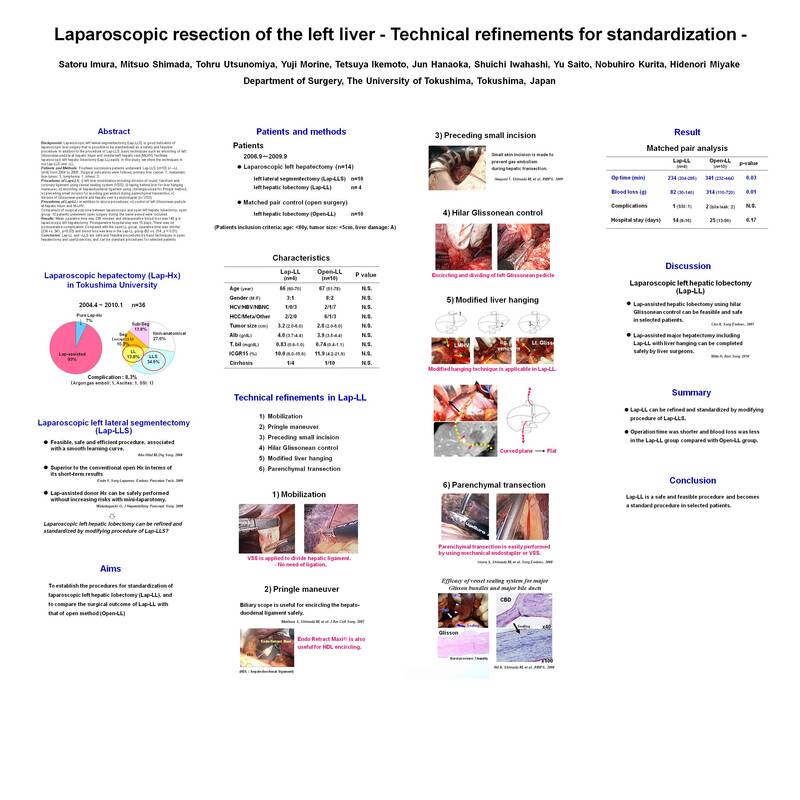 Laparoscopic left lateral segmentectomy (Lap-LLS) is good indication of laparoscopic liver surgery that is possible to be standardized as a safety and feasible procedure. In addition to the procedure of Lap-LLS, basic techniques such as encircling of left Glissonean pedicle at hepatic hilum and middle+left hepatic vein (MLHV) facilitate laparoscopic left hepatic lobectomy (Lap-LL) easily. In this study, we show the techniques in our Lap-LLS and –LL. Fourteen successive patients underwent Lap-LLS (n=10) or –LL (n=4) from 2004 to 2009. Surgical indications were follows; primary liver cancer: 7, metastatic liver tumor: 3, lymphoma: 1, others: 3. Procedures of Lap-LL; in addition to above procedures, vi) control of left Glissonean pedicle at hepatic hilum and MLHV. Comparison of surgical outcome between laparoscopic and open left hepatic lobectomy; open group: 14 patients underwent open surgery during the same period were included. Mean operative time was 238 minutes and intraoperative blood loss was 140 g in laparoscopic left hepatectomy. Postoperative hospital stay was 15 days. There was no postoperative complication. Compared with the open group, operative time was shorter (234 vs. 341, p=0.03) and blood loss was less in the laparoscopic group (82 vs. 314, p = 0.01). Lap-LL and –LLS are safe and feasible procedures by basic techniques in open hepatectomy and useful devices, and can be standard procedures for selected patients.